Mike Flynn, head of A&R and Staff Producer at EPIC Records, will select one artist from the Top 20 finalists in the Get Your Song Produced by Mike Flynn of EPIC Records Channel to travel to either New York City or LA where he will personally guide the production of their next hit single. One (1) song engineered and produced by Mike Flynn. Option to produce full album if artist is signed within 6 months of producing track. Up to two thousand dollars ($2000.00) for each individual (if a solo act) or band to offset expenses to be provided by OurStage. 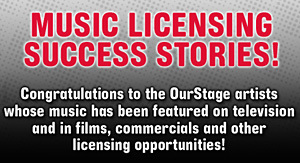 Songs entries must fall into OurStage's Rock, Pop, or Country genres. Artists can only submit one song into the competition and must be thirteen (13) years of age or older at the time of entry. One artist or band member must legal resident of the United States as of March 1, 2010.